After years of hard-working, you are finally able to open your very first store. You checked all the equipments you have in your new store, and suddenly you realize that you forgot to buy a receipt printer for your store’s cashier! You start to worry again. What type of printer should I buy? A thermal or a dot-matrix? Is the printer going to print out crystal-clear receipts? Is it going to last for a long time? You won’t have to worry about those trivial issues because we are going to introduce you the top ten best receipts for your stores. 9. 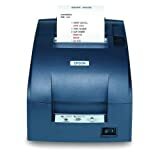 Star Micronics, TSP143IIU WHT US, ECO-Friendly Receipt Printer, USB (cable incl. ), Auto Cutter, Internal Power Supply with Power Cable Incl. 3. 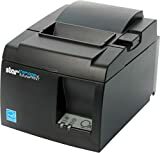 Star TSP100 TSP143U , USB, Receipt Printer – Not ethernet Version. Do you want a speedy receipt printers to handle a long queue of waiting customers? Then the Star Micronics TSP143IIILAN is a perfect choice for you. It can handle high-speed printing of 43 receipts per minute (250mm/s). It is also easy to set up with the Ethernet (LAN) connection with included cable and it also comes with an Error Reporting Feature and Real Time Status alerts as well. The “Drop-In and Print” design allows for fast and easy paper loading, and its “De-Curl” function always delivers a flat receipt. This 5.6 x 8 x 5.2 footprint and its embedded power supply could saves yout cashier’s precious counter space. This printer also has futurePRNT Software which allows you to customize receipts to attract buyers to your store and even gain loyal customers as well. Looking for a environmentally-friendly thermal printer? Then why don’t you try this Star Micronics, TSP143IIU printer. 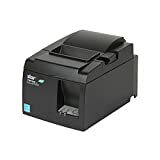 This printer is the Star’s first ECO POS receipt printer which supports the Star’s contribute to save the environment while allowing Star to continue to provide a high-speed, software enriched, economical choice for customers as well. This printer can reduce 75% in power consumption and up to 70% in paper consumption. Buying this printer will surely earn many praises from your environmentalist customers. Want to look for other environmentally-friendly receipt printers? Then, we will introduce you to this CITIZEN CT-S310I printer. It has many benefits which include lower cost with more features, lower power consumption and excellent paper savings. It comes with a dual interface of a USB and serial interface on board, so you don’t have to worry that your printer will be outdated. Worry about its maintenance? No problem! It has an easily removable auto cutter and printer head which are made for quick and easy maintenance. Long Life Print, The new LLP functions can extend the print head life up to 200km. If you are looking for a monochrome receipt printer, then the TM-U220B printer is a perfect choice for you. This printer can handle the mono print speed up to 6 lps. It can print out 9-number pins and 42 columns, and it has a standard memory storage of 4KB. This 6 x 4 x 5 inches printer is compacted, reliable, and optimized for high-speed throughput and it also offers easy-to-use features as well. This Epson TM-T88V receipt printer is the latest addition to Epson’s industry leading TM-T88 POS printer Serialies, designed for food and retail environments. This 7.7 x 5.7 x 5.8 inches printer has the maximum mono print speed of 11.81 in/s, maximum print width of 2.83″ and a standard memory of 4 KB. It also comes with various optional interfaces as well such as Wireless LAN IEEE 802.11a/b/g/n, Wired Network, Bidirectional parallel, USB 2.0 Type B, RS-232, and Drawer kick-out. This TM-T88V offers more speed, features and reliability than ever before. The 58MM USB Thermal Receipt Printer is physically convenient as it is lightweight and easy for portability. This printer is ideal for receipt, bill, and ticket printing and can be used in POS systems, restaurant systems, and industrial control systems. This printer comes with low-cost, low-noise, and high-quality thermal printing. It is also easy to install paper-roll and maintain as well. This printer has the print speed of 90mm/sec and reliability print of 100km. This Bluetooth innovative printer is Apple MFi Certified and it can be used with iPad, iPhone, and iPod touch as its operating system can support iOs, Android, and windows. This 6” depth and 3” width printer is capable of printing 60 receipts per minute with its high speed of 300mm/ sec, and it is equipped with reliable guillotine cutter drop-in and easy print paper loading as well. We would like to introduce the TSP143U GRY, its first all-in-one receipt printer, which you can find all the parts and software in one box too ease your setup. It also includes software utilities which you can redesign your receipt without modifying your application, add logos, add coupons, preview receipts, and enhance bar codes. The TSP143U GRY is also a fast printer with the Mono print speed of 125 mm/s . It’s the All-In-One-Box printer which includes many amazing features and high reliability at an affordable price. This thermal receipt printer include the standard connectivity with both USB and serial interface. This latest Epson product can lasts for many years of use. Many customers praises it due to its quick and quiet functionality and its easy installation. This 5.5 x 5.8 x 7.8 inches is really convenient to fit into small spaces, and it can save you from another headache of finding a location to place it. Can’t get enough with the Star’s product? The company would like to introduce you to ones of its best receipt printer, the TSP143IIU GRY, its first all-in-one thermal receipt printer. To make the setup quick, the printer is included with an internal power supply, interface cable, power cable, complete mounting kits and a paper roll. You can also redesign your receipt without modifying your application, add your logo, add coupons, preview receipts, and enhance bar codes with its software utilities. It also comes with an operating system drivers which allows for ‘Plug & Play’ automatic installation. 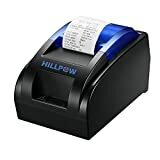 The receipt printer is one of your essential equipments you should put extra care and consideration because you would use it often for your sales.You do not have to worry the trouble of choosing the correct receipt printers for your store because with our recommendation above, you can easily pick your own perfect receipt printer that can assist your business for years.